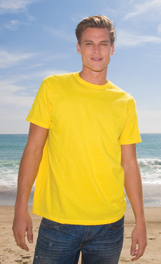 *4.3 oz 100% Combed Ringspun Cotton. *Set-in rib collar with shoulder-to-shoulder taping. *Athletic Heather 90/10 Cotton/Poly Body. *Colored Heather 50/50 Cotton/Poly Body.